Now in its 39th year of publication, PricewaterhouseCoopers (PwC) and the Urban Land Institute (ULI)’s Emerging Trends in Real Estate is a highly-regarded and widely-read forecast report in North America that provides an in-depth review of the key trends and outlook in the Canada and US real estate markets. There’s a persistent question in every market regarding where we currently are in the real estate cycle. Craig Hughes, global head of PwC, noted that there is a continuing flood of capital coming in with asset and wealth management in real estate expected to grow from $1.8 trillion to $5.4 trillion by 2025. The challenge is determining how to source and allocate assets as well as recognizing the disruptive impact of technology. “Rebalance, rethink and reinvent are the three main themes relating to emerging trends within the Canadian perspective,” remarked Andrew Warren, Director of Real Estate Research at PWC and one of the report’s authors. Participation for interviews and the online survey for the report was the highest it’s ever been and when participants were asked what five words they would use to describe the 2018 real estate market, the following responses came up: competitive, cautious, measured, uncertain, and growing. The market itself isn’t bigger, but growth is reflected by investor’s willingness to expand their portfolios in different sectors. Despite the overall high pricing, investors are not panicking. The trends that will drive Canadian real estate in 2018 are: transit to transform cities, affordability on housing, the rise of placemaking, rebalancing portfolios to great competitive advantage, making the 18-hour city a Canadian reality, reinventing real estate through technology, evolving tenant expectations, and the global war for talent. The annual launch event for this year’s report was held on November 3rd at The Carlu with a discussion moderated by Nadia King (Partner at PwC) along with an expert panel offering their unique insights. 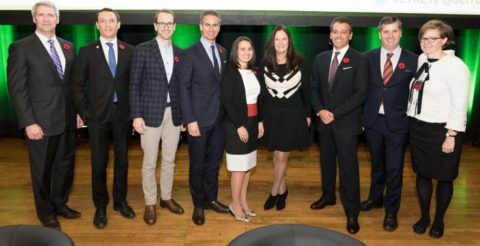 The panelists were Michael Turner (EVP & Head of Canada to Oxford Properties Group), Paul Morassutti (EVP & Executive Managing Director, Valuation & Advisory Services at CBRE Canada), Eve Lewis (President of Woodcliffe, Marketvision, and Urbanation), and George Carras (President at RealStrategies Inc.). Affordability, labour shortage, place-making and technology were the main subjects that dominated the conversation. Morassutti noted that Canada has enjoyed an unprecedented eight year bull-run on the commercial real estate side which has led people to question if the sector has peaked and if a recession is imminent. Putting things into context, Canada’s GDP growth has been the highest of all G7 countries in the first half of the year. Although the Bank of Canada has raised interest rates, cap rates are compressed and fundamentals have excelled. Because limited historical precedent is available for comparison, the cycle could be extended for a few years. Lewis recommends a cautious approach when it comes to condos. Despite soaring condo sales (volume was at 27,058 in 2016 with yield estimated to reach 34,000), new condo completions are way down. Consequently, rent has increased because it’s a reflection on supply. If volume of completed condos cannot keep up with demand, affordability will be an issue. Turner noted that the increase of construction costs (affected in part by the long-term impact of Green Belt) and labour shortage have led to cost escalation. Morassutti believes that the affordability issue is something that should be addressed rather than ignored. Government policies have a tremendous impact on development and 2017 has seen some big policy shifts, such as interest rate changes, mortgage rule changes, and the overhaul of the OMB. Turner warned that some policies in Toronto and the GTA are populist and tend to apply short-term thinking that can hamper city building. As a result, experts who can liaise with government are often needed on project approvals, in which their professional fees can account for 20-25% of the entire project. When it comes to rent control policies, countless studies have decried its effectiveness and detrimental impacts to housing stock growth potential. Lewis noted that to counter multiple policies fighting each other and a lack of a rental program, the government has now put in place a new program designed to compress the supply of new build products. Morassutti discredited the perception that the expansion of rent control would deter the construction of purpose-built rentals and believes that there will be a resurgence down the line. Carras noted that housing as a framework has layers of government around it and we can’t expect policy to fix everything. Innovation needs to step in and will likely come from consumers. A rise in multi-generation homes and co-living spaces has emerged as a consequence of high urban living costs as well. Carras stated that co-living spaces aren’t cheaper, they’re just more flexible. As for multi-generational housing, if they’re not recycled through sale, it would be through innovation. Finding talent has become a critical issue in this period of disruption and innovation. Turner noted that when it comes to completing commercial real estate leases, the conversation is now driven by HR, talent procurement, culture, and branding rather than facilities management. It’s about people, where they want to be, and where they can afford to live. This shift has led to the rise of the 18-hour city and the question of where the next one will be. Montreal is experiencing a renaissance and going vertical in its downtown, benefitting from investment in private and public sector and educational institutions. Turned said that tech companies are going to places like Denver, Salt Lake City, and Austin because they can hire programmers at $100,000 who can afford to live in the city rather than a programmer making $250,000 who can barely afford to live in more expensive metropolises like San Francisco. The same migration pattern can be seen in the Kitchener-Waterloo area. Certainly, affordability and place-making are important factors in retaining, attracting and identifying talent. Transit would be an important vehicle to help develop these fresh areas in need of more mixed-use real estate to foster a sense of community. “There’s an important difference between last year’s report and this year when it comes to technology and innovation,” observed Carras. 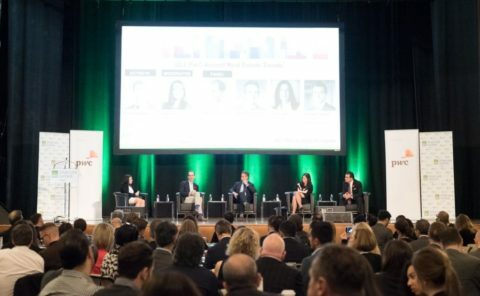 “Last year’s report on tech focused on technology’s impact in business in real estate, [while] this year, touched on the impact of technology on business in real estate.” As noted in Andrew Warren’s keynote address, real estate has been slow to adopt technology, but its integration is coming rapidly. On the venture side, the tech business in real estate is reaching a billion dollars and further innovation on off-site construction, robotics, and materials will be impactful. Proptech is expected to grow exponentially, providing tools that help buildings operate more efficiently, keeping tenants happy, and collecting data that aids the building owner to be more profitable in running their assets. Carras further asserted that when technology is married with a new business model, it makes the biggest impact. Retail is one sector that has seen massive disruption. An example Carras brought up was Apple’s augmented reality development kit. IKEA took the technology and created an app that allowed consumers to virtually ‘place” furniture in the space to scale. Houzz has the same technology, but unlike IKEA, that has 20,000 items in its inventory, there’s over 500,000 items in Houzz’s catalogue. The data collected by Houzz allows the app to recommend inventory that the consumer likes. Turner noted that where retailers were once concerned about sales and market-share, they now want profit. By going digital, better analytics are available for landlords on their customers. The key is to use this data to find new opportunities and evolve or die. This year also marked Toronto’s bid for Amazon’s new headquarters. Through the tech behemoth’s acquisition of Whole Foods, e-commerce may finally disrupt one of the last frontiers of retail: groceries. Despite being unsure if it’s entirely a great thing to have Amazon here, “if there’s anyone who can challenge the political (and Twitter) ire of Donald Trump, it would be Jeff Bezos,” quipped Carras. Morassutti believes that Toronto has a real shot at it, but the decision will be made for what’s best for Amazon. Lewis noted that everyone is fighting for Toronto to be recognized as a world class city and the city’s participation in the Amazon bid has certainly placed it on that list. On November 20th, 2017, Urban Land Institute Toronto hosted a members-only breakfast event with Metrolinx at the head office of Arup Canada.